Transparent ice blades had covered half of the battlefield as more and more ice blades kept shooting out of the mist door behind Yun Xi. Hua Huo brandished the reforged broken sword, blocking all the ice blades easily. Countless ice fragments exploded on the battlefield, creating a Freezing Field with an extremely cold temperature. Every time when Hua Huo blocked the ice blades, which also meant that she couldn’t block other attacks at the same time. Yun Que would always shoot an Arrow of Bloodthirsty Demon Hound to her. At the same time, her Mist Soul would also appeared beside Hua Huo and launch an assassination attack. Danger! Danger! Danger! For the first time, Hua Huo’s attack was suppressed. If it wasn’t because the broken sword could emit a devastating light beam at the critical moment, Hua Huo probably couldn’t hold on one minute. The person who caused her dilemma was Yun Xi. He had to attack his childhood sweetheart for victory. Based on his understanding about Hua Huo and with the help of his White Emperor Mask, Yun Xi chose the best tactic to stop Hua Huo. He had Hua Huo’s Seed in his body, naturally, he understood that once Hua Huo got close to him, the battle would be finished. Him and Yun Que couldn’t win against Hua Huo in close combat. Once Hua Huo used her true power, even if they were as strong as a dragon, they would still be killed by her in one hit. Therefore, they must stop Hua Huo to dictate the tempo of the battle. It was impossible to win against Hua Huo with a sword! In Yun Xi’s mind, the only sword skill that was a match for Hua Huo’s Sky Flying Sword was Yun Hai’s Sword Master sword skill: Yun Hai’s Quadrant Sword. Only a godlike sword skill can compete with another godlike sword skill! However, Yun Xi hadn’t learned Yun Hai’s Quadrant Skill, therefore, the tactic he used now was the only method that he could use to defeat Hua Huo. He would cooperate with Yun Que, stopping Hua Huo approaching him, so that she wouldn’t have any chance to use her sword skill. His incredible energy from the one million brides was the only way to beat back Hua Huo from a distance! Therefore, he opened the mist door and let the ice blades fly. No matter how many ice blades Hua Huo had broken, there would always be more and more ice blades shooting at her. Undoubtedly, Yun Xi had the strongest range attack ability in the entire Water God’s world. In Yun Que’s eyes, Yun Xi’s behavior was like throwing a mountainous counterweight on the balance of this battle. For the first time, Yun Que saw the light of winning this battle. It was also the first experience to Hua Huo to be forced into a disadvantage. It was quite incredible since she could always beat down her enemies with great ease. In Hua Huo’s heart, this silver masked man was the first person who had the same great talent like her. However, why don’t I feel hostility from him? We are enemies. We should fight at full tilt, but why can’t I feel killing intention from his attacks? Compared to him, the archer in red was more competent. I can feel his sharp, undisguised killing intent coming from the bottom of his heart. “Are you… looking down on me? Do you think I don’t deserve your full attack?” A strange smile appeared on the corner of Hua Huo’s mouth. I had never thought that I would be shown mercy by my enemy someday. Little Xi, if you know it, will you laugh at me? It looks like I should be more serious. “No, too bad…” Looking at Hua Huo’s eyes, Yun Xi immediately realized that something was wrong. 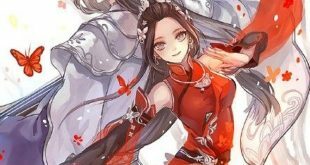 Hua Huo rarely showed such a smile on her face. She was a sunny girl and was always friendly to everyone. In Yun Xi’s memory, she only showed such a smile a few times when she was extremely angry. The most vivid memory in Yun Xi’s mind was when his sword skill teacher tried to teach him something in her room, Hua Huo suddenly broke into the room. At that time, she showed a similar smile on her face. Holding the broken sword, which was covered with bloody lights now, Hua Huo moved a step forward. “Boom!” Bright lights exploded from the broken sword and formed a round of blood colored shield around her body. Yun Xi’s ice blades hit on the shield and exploded, but caused no damage to the shield. “She is coming!” Yun Que looked at Hua Huo through her Water God’s Mask. In her eyes, Hua Huo’s aura was like a giant light column, connecting heaven and earth. “One!” Hua Huo took a step forward, striding over a hundred metres. It wasn’t like the “Quicksilver Motion” Yun Xi had learned. Hua Huo wasn’t simply increasing her speed, but actually strode over a hundred metres in a step. Stop Hua Huo by using range attacks – Yun Xi’s tactic wasn’t wrong, but was too naive. Sky Flying Sword meant the will of hovering in the sky freely. It was impossible for the ice blades to stop Hua Huo! “Shuffle! Shuffle! Shuffle!” Yun Que marked Hua Huo’s path in her vision. After all, Hua Huo wasn’t trying to hide her intention at all. She was going in a straight line, the simplest route! And at the destination of her route, it was the core of the Mist Soul Army, their Emperor, Yun Xi! “Shuffle! Shuffle! Shuffle!” Yun Que shot sixteen arrows. Since she had known Hua Huo’s route, it wasn’t possible for the arrows to miss. “Two!” Hua Huo didn’t even look at the sixteen arrows and let them expode on the blood colored shield. She walked the second step toward Yun Xi with a determined look. Compared to the first step, the second step crossed a longer distance, and the transparent halo under her feet was bigger. It was a sword skill Yun Xi didn’t know and couldn’t understand. Even as Hua Huo was surrounded by an army of one million, she still looked as if she was walking in the back yard of her house. In front of her Sky Flying Sword, all beings are equal. Once she used the Sky Flying Sword, she would never retreat! “I didn’t imagine that it was possible!” Yun Que ground her teeth. Her body suddenly emitted a similar aura like Hua Huo, because she had used the secret skill from her Water God’s Mask: Multiple Competences Enhancing!